Moved to LivinLaVidaLowCarb.com/Blog: Should A Christian Low-Carb Dieter Refuse High-Carb Communion? Should A Christian Low-Carb Dieter Refuse High-Carb Communion? When you first start livin' la vida low-carb, it's almost impossible to think about all the ways your life will change overnight. Sure, you know you're not allowed to eat bread, pasta, sugar, candy, juice, rice, and just about anything sweet and starchy. You do it willingly because you realize that changing your lifestyle is about making healthier choices for your body so you can honor the temple that God has entrusted you with. As a Christian low-carb dieter, it never occurred to me when I began this new way of eating in 2004 that it would make me choose between honoring God with one of the most important sacraments that Christians participate in or honoring my commitment to low-carb living. 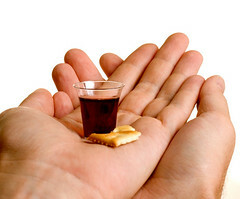 I'm referring to the act of communion where you consume a small cracker or unleavened bread wafer representing the body of Jesus and a small cup of grape juice or wine symbolizing Christ's blood sacrifice for our sins on the cross. This might seem like a silly question but I'm guessing that since you are a Christian and are active in church that this issue has come up for you. Do you take communion? Bread and grape juice do not fare well for my low-carb lifestyle but when I pass, I feel very odd because I want to participate for the spiritual meaning. Let me know how you deal with this. You know, it was funny the first time I was in church on a day when communion was taking place and I felt so awkward. Do I take part in it and glorify the memory of the greatest act of love and sacrifice the world has ever seen or do I refuse since I can't have that many carbohydrates as part of my new commitment to livin' la vida low-carb? It wasn't such an easy decision for me and I had a tough time at first. But then I thought about it more and came to the conclusion that the amount of carbs in that little piece of bread and tiny glass of grape juice probably doesn't amount to more than 8-10g carbs maximum. It's not like this is an entire high-carb meal or anything. In the end, I believe God will honor your dietary commitment because you partook in communion. I always participate in Communion. We get about a thimbleful of grape juice and about a cubic centimeter of bread, so in this case it's probably 2 grams of carbs. Good topic, I too felt weird the first couple times it happened. I then came to conclusion that God has the power to do anything according to His will, including not affecting my weight loss. I also don't drain the cup of juice. There's always half or so left. It's a little thing I know, but everyone has to some quirk. During Communion at our church, we don't have the little plastic cups of juice like in the picture. They take a small piece of fresh baked bread and dip it into a large cup of juice. If you want to minimize your carb intake, you could dip your bread into your juice cup, and not drink the leftover juice. Hope this helps. My problem is that I hate soggy bread or anything soggy, so I cringe everytime I have to eat the Grape Juice Bread! LOL. Years ago when I went low carb my husband and I started sharing one little cup and little cracker as it came to us. Now it is something we enjoy showing our oneness as a married couple doing. We take communion every week. Like you, I am a committed low-carber, pretty much always hangin' near induction even though I'm now at goal. Like you, I'm also a committed Christian -- a lifelong practicing Catholic. I must admit that the carb content of the Eucharist sometimes crosses my mind, but I know that I could never turn down Christ in favor of reduced carbs. (Catholics believe the bread and wine becomes Christ's body and blood.) I take Communion, and I never notice the difference on the scale. I'd have it no other way. My personal advice: Don't skip Communion. You'll be rewarded. The real issue is Celiac disease. A small amount of carbs can easily be budgeted into a low carb diet plan. No amount of gluten can be tolerated for most people with Sprue. My church has communion every week and I've always participated without hesitation. I feel that the spiritual aspects of this act far outweigh any weight concerns I might have. A dear friend of mine has Caliec's disease and she provides her own gluten free wafers to the church for her use. The priests at her local parish have no problem with it - I think they bless them or whatever (I'm protestant so I'm not sure what all is involved in the Catholic rite of communion). When she's visiting her mother's parish they refuse to do it. Two of her cousins had communion offered at their weddings - one parish priest was fine with it and the other refused her request before the ceremony for a gluten free communion. Maybe the thing to do is urge your hurch to switch to a whole grain version of the communion bread - if for no other reason than authenticity. They probably didn't use (or even have) bleached flour in Christ's time, right? And I quibble a bit on the grape juice thing. I've always been confused why so many chruches go to some length to find unleavened bread that's very close to authentic, yet make no effort to use real wine. Aside from recovering alchoholics (and I certainly mean no disrespect to them), a teensy little thimble of wine isn't going to harm anyone - and actually has more health benefits than grape juice. Above all, I agree that communion is vastly more important than the tiny hit to your carb intake. Would it be wrong to bring cheese and chicken as a substitute? It is just a small amount. I just do what God tells me to do and leave the results in God's hands. That appoach hasn't failed me yet.